Paul Stewart is a multi – award winning photographer who has worked around the world for over 40 years for agencies, national newspapers and magazines. He started his career while still at school in 1960s photographing the UK rock music scene for various record companies, the music press and the seminal “underground” magazines that sprang up in London at that time. . These included International Times , Frendz and perhaps the most (in)famous of them all, OZ . His work has been published in over 190 countries.After a career freelancing for the all the UK daily and Sunday national newspapers plus the London Evening Standard, World wide clients include titles like Newsweek and the Jerusalem Post. He founded the ISF agency, the first international picture provider to fully exploit digital delivery systems. At the end of the 1990s, Stewart teamed up with mobile phone provider one2one, then part of Cable and Wireless, now part of T-Mobile, to beta test their new mobile data system. They wanted large digital files to send across the network to test it and he needed a way to get pictures to the desk fast. This collaboration changed the way press photographers sent images, the world over. He then went on to start the agency Pictures On The Page, which with the advent of accessible digital video, became Paul Stewart Media, for whom he filmed and directed items for clients as diverse as the UK JeepClub, Essex County Council and the Department of Health. Stewart also undertook and continues to work on special projects for major charities, including Shelter, MERLIN, The International Red Cross (ICRC),The British Red Cross, The National Canine Defence League (now the Dog’s Trust) and Christian Aid. Also, he has had a number of exhibitions of photojournalism including “A Quiet Night” – 24 hours with East London’s emergency services, “Revolting Britons” (From Welling to the Criminal Justice Bill via the M11 Link) and “Lamb to Loom”, a project with the International Wool Secretariat. His major project for the 90’s “State of the Nation” was a study of the problems and solutions of homelessness to mark Shelters 30th year.for more information. Press assignments are too numerous to list they have ranged from celebrity events and pop and rock music concerts to war zones, riots in London and other UK and European cities. His award winning features on social issues stem from a life long interest in homelessness round in the U.K. and crime in the East End of London. 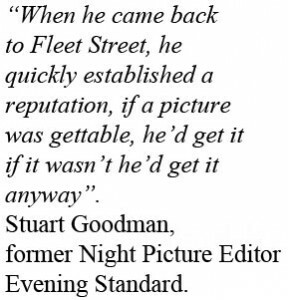 Having spent time based in the USA, Stewart returned to the UK and became the main night news photographer for the London Evening Standard, the then Night Picture Editor Stuart Goodman was later to say of him “When he came back to Fleet Street he quickly established a reputation, if a picture was gettable, he’d get it, if it wasn’t he’d get it anyway”. Also, as a leading exponent of digital picture transmission, credited by many as the inventor of the “Virtual Picture Desk” Stewart made available the latest technology to charities, aid agencies and commercial clients to enable them to get their message across to the media more effectively. 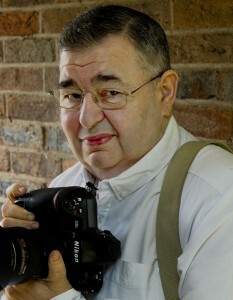 As a writer, as well as filing news reports to U.K. national papers Stewart was a regular contributor to the British Journal of Photography, Professional Photographer and PHOTO-Pro writing on press and photojournalism and giving expert reviews and analysis on new products especially in the digital field. He was also the editor of Hotshoe International then the UK’s leading professional photographers magazine. The second decade of the 21st century sees no let up, with his appointment to the staff of the Daily Express as Night Picture Editor and his embarking on an ambitious project of personal work, “2016 – A Year In Black & White”, This sees him turning the clock back 40 years and after being the leading exponent of digital technology for photojournalism, going back to analogue roots with traditional photographic materials and techniques. In his career he has been given many photographic awards, these include three Kodak – Mirror awards for News, Features and Sport photography, Two National Association of Press Agencies, NAPA Awards for News and Feature photographs. Three Nikon monthly press awards and others in the USA, Japan, Korea and Israel. The British Press Photographers Association 5000 Days at the Royal National Theatre, 2004. Stewart lives in Petersham, Surrey near London with his wife, fellow photographer Vivien Stewart.